Do you ever find yourself wondering what to do with leftover rice? The curry you made the rice for, is over. Yet there is a little bit of rice left. I often have this problem since we eat a lot of rice in our home. Most times I make another quick curry to finish off the rice. 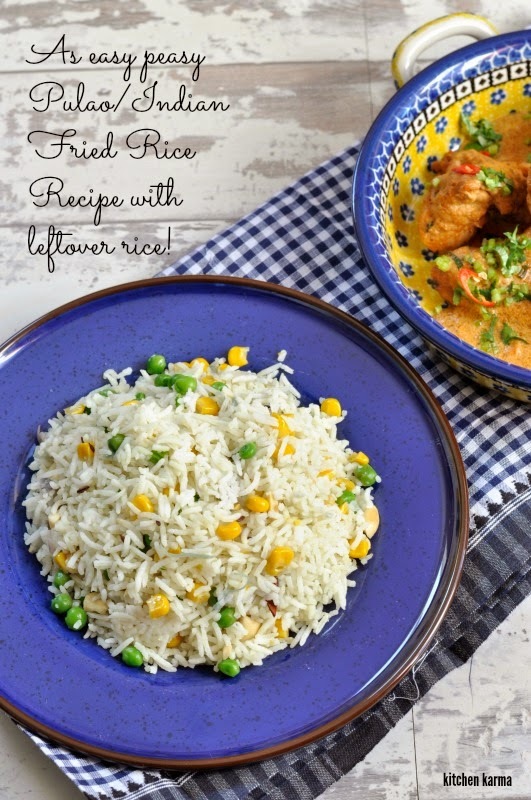 Sometimes when I am in the mood or there is something special lined up for dinner I make this easy and quick Indian fried rice. It is extremely quick to make and goes very well with most Indian curries and daals. I add a little sugar to it, if you don't like that in your savoury food, leave the sugar out. 1. In a heavy bottomed pan/karahi add the oil. Once the oil gets hot and starts to release fumes, reduce the heat to medium low and add the cumin seeds, the whole garam masalas and the sliced onion. 2. Fry for a couple of minutes till the onions turn glassy. 3. Add the green peas and the sweetcorn. If adding cashew nuts, add at this stage. Fry for a couple of minutes. 4. Now add the sugar and the salt and the green chillies. 5. Mix everything well and then add the rice a little at a time, all the while mixing gently. If you mix vigorously, the rice will break and get smashed. 6. Fry the rice for about 5 mins or so. 7. 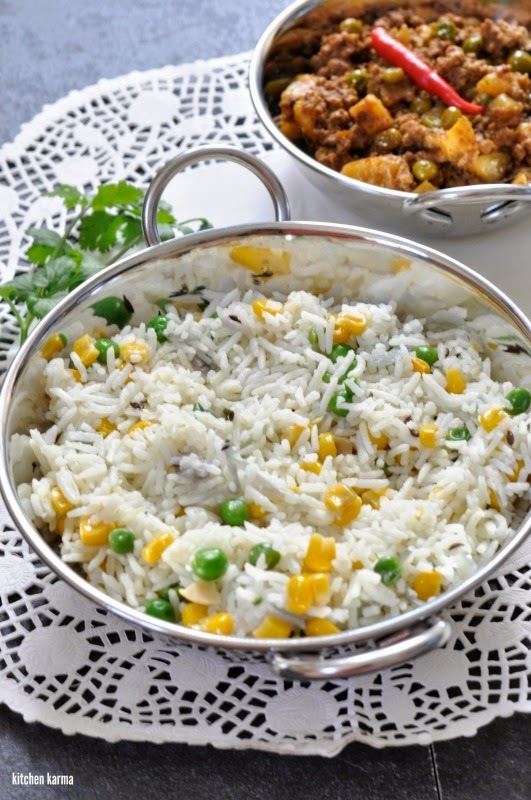 Switch off the heat, let the rice rest for 5 to 10 mins before serving. india inspired bhat recipes. will try yours soon.